Pip is the best kind of reader. She gets it! Thanks Pip. And here’s something you might not know – the publisher at The Doby Press is none other than Solly McKeen, all grown up and moved on since she first appeared in “How to Stop a Heart from Beating”. I love it when readers travel with me. When I think deeply about ‘home’ I realise that for me, it is not a place. My passport says I’m Australian, I live in New Zealand and spend months of each year exploring some other part of the world. I have come to the conclusion that ‘home’ is in my head – and probably in my heart. It’s the amalgamation of all that I am. And when I feel ‘lost’ it’s often because I’m attempting to do something/think something or act in some way contrary to that which my head and heart expect. At that moment I am ‘lost’. And while we’re on the subject of Lockie Steele – yes, she’s lost – and lost again. But she is resilient. She’ll always find her way ‘home’ in the end. If you have read The Silver Gaucho you will have seen Realico through my writing eyes. You will know some of the history and changes that have impacted this isolated place. And you will know what became of Realico when the TV production circus rolled in to film the hugely successful soap opera, The Silver Gaucho. Aside from the writer’s imagination – here is the real Realico. In the heartland of Argentina, near the point where the provincial boundaries of La Pampa, Cordoba and San Luis intersect, is the town of Realicó. The location is just north of the junction of Routes 35 (north-south) and 188 (east-west). It’s in the middle of nowhere. My first visit to Realicó was on a bus travelling from southern Chile to Buenos Aires in 1998. I was backpacking, collecting information for a South American edition of ‘Snapshots’. Back then, I knew nothing of El Gaucho de la Plata. I’m on a bus again now, but this time I’m wide awake and watchful. I’m thinking about all that has happened in this place. The town is sited 146 metres above sea level. It’s flat. Dead flat. Surrounded by more flatland than might be imagined – a visual conundrum in the middle of the steppes, the prairies, or as the Quechua language would tell it: Las Pampas. During the Wild Years, guanaco and rhea ran free here, pursued only by hunting and gathering Querandies. Oral histories confirm that in long-ago times flamingo colonies flocked to the salt pans in vast numbers as they do today. No doubt, when the birds took flight, they blocked the sun in the same way as they rose in concert. And back then, I guess, the beating of their many wings would have produced a similar downdraft. Were the hunters and gatherers in awe the first time they witnessed the flight of the flamingos? Was the ensuing silence more profound? And when the warm breeze fluttered did the Querandies feel restless, as I do? I stare out from the bus across to the endless Pampas. Grass tips shudder and tremble. They ripple and pucker, rising, swelling, ebbing like a wide and gentle sea. I hope the spirits of the Querandies are mollified by the whispering grasses. It was in the seventeenth century that the cattle and horses came – herds and hordes of both. Liberated by the Spanish invaders who no longer needed them, the animals made their way out into the wilderness. They went forth and multiplied. It could have been expected that they would live in relative peace as the guanaco and rhea had done, but hot on the heels of the cattle and horses came the gauchos. The early gauchos de Las Pampas were a mix of outlaws, itinerants and adventurers. Some were Querandiies, some Patagones or Tehuelches, and some Mapuches and Aracaunos from the other side of the Andes. A few were immigrants who sailed from faraway places, jumped ship along the coast of the continent and made the best of what they found as they moved inland. They met in the Pampas. Many became agile Criollo horsemen – nomadic, singular men who threw the deadly boleadoras, a weapon borrowed from the Indians, to bring down their prey. By the second half of the twentieth century Realicó had become what locals like to call the Granary of the World. It was a commercial bread basket. Cargill’s, the American grain-growing giant, moved in after the Second World War. The company became the town’s major employer. Within a few years this corner of Las Pampas was irrigated and tamed. Some say the agrarian move heralded the beginning of the end of romance for Realicó, that when people turned their eyes towards cultivation and harvest on such an enormous scale, they traded something essential for a short-term compromise. In a short space of time Realicó was to be turned on its head. Towards the end of 1998 Producciones Películas Colonia rolled into town to film El Gaucho de la Plata. The local residents could not imagine how their small part of the world would be transformed by a TV production circus. They could not believe that a day would come when, instead of re-fuelling or passing through without a backwards glance, people would make Realicó a tourist destination. Now billboards at all entry and exit points read: La Ciudad de “El Gaucho de la Plata”. In the middle of the town is an information centre staffed by locals who answer endless questions about the show and its stars. Ice cream parlours, themed restaurants and parillas line the streets. Young people drop out of school to become overnight tour guides. And anyone who has a 4×4 is using it to show people around. Realicó is on the map. Tourists come in their thousands. They come looking for food and accommodation, for camp sites, toilets, petrol stations, postcards, guide books, DVDs. They need telephones, internet connections, batteries. And since the death of Luis Mabon they come with their floral tributes and their tears. They come to take photographs, to put their feet on hallowed ground, to stand together in bewilderment. Here is another of the characters from The Silver Gaucho. You don’t have to like him! On a hot September day in 2001 I am meeting with Eduard Millan. The arrangement is for Saturday 8th. I am told he only sees people like me on Saturdays. Meanwhile, the entire continent of South America is awash with El Gaucho de la Plata. Luis’ face is everywhere. The soap has been airing on TV twice daily for three years and its popularity is unparalleled. Luis Mabon has become an international celebrity and the telenovela, a network tsunami. The producer is on a roll. Even before we come face to face, I know I will dislike him. Eduard Millan is elusive, slippery. It takes nine phone calls before we speak, and only then because Luis intervenes on my behalf. Eduard will not meet me in Buenos Aires, which would have been relatively easy, but insists that I make a ludicrous pilgrimage north across the watery border into Uruguay. He also hands me a glass of champagne and grants me an audience of fifty-five minutes. Exactly. Eduard lies back on his day bed, takes a sip from a flute of Mumm and looks out across the glassy water. Here, on the balcony of his rented villa in the old port of Colonia Del Sacramento, he says he is released from his web of entanglements. Eduard shifts focus and lifts his glass into the sunlight. He contemplates the colour of the champagne. Buttercups. He says this particular champagne makes him think of buttercups – those same wild flowers that grew near his home in Connecticut. He tells me that he often picked them for his mother when he was small. And she would select one, hold it under his baby chin and declare that her Edward did, indeed, like butter. But his mother and the Buttercups are long gone. And the ‘w’ in his name has been replaced with a ‘u’. I cannot imagine Eduard Millan as a child, not in my furthest headspace. But I am surprised by his recounted memory. Is the trinity of mothers, little chins and buttercups universal? The producer appears mesmerised by the bubbles in his glass. Either that or he’s stoned. He takes a second sip and lets the flavours of pears and honey roll around the inside of his mouth. He says he enjoys the anticipation of the dry finish: the sharp back-bite, particular to Carte Classique. He says it leaves him pleasured, wanting more. I shudder and wonder if I have something different in my glass. And then I recall that I have tasted this champagne before. The label is familiar. I take a closer look. Luis poured me a glass of Mumm, too. It was in Buenos Aires, just after I returned. We were cruising the city in a black limousine. When Eduard Millan is working, the need for sensory gratification gives way to the need to succeed. Freedom is exchanged for control, indulgence for aggression. Market forecasts and financial predictions prevail. On the job the producer is antagonistic, mean, disagreeable. He talks of top-down solutions, of drilling down to expose weak links, of squeezing, milking, screwing, discarding. The sun lingers over Uruguay and toasts Eduard Millan. He turns frequently so that his body tans evenly. There is no place in his world for the colourless. The producer’s skin reminds me of lizards, snakes, creepy things. I wish less of it was on show. I move my chair into the shade, but I am really moving away. Eduard says he was here in Colonia, watching old Zorro movies, when the idea for the telenovela hit him like a popping cork. An Argentine Zorro, he thought, I’ll create a super gaucho. He’ll have the intrigue of Don Quixote and the virtues of Robin Hood and he will be my home-grown hero. As far as I know, the producer has never heard of Antonio Gil, the real hero of gauchos in Argentina. I am almost certain he has never been to the shrine in Mercedes, in the province of Corrientes, has never paid homage to the little man in the red poncho. If he had, maybe the telenovela might have been a very different story, perhaps with a different name. But it might not have been as popular. Eduard’s face is flushed. The backrest of the day bed has pushed his waxed hair to one side, as if it were a solid object. He is unaware as he describes that memorable day when, excited by his vision, he walked out onto this very balcony where we are now sitting. He looked across the haze that hung above the Rio de la Plata and had a light-bulb moment. I’ll call him El Gaucho de la Plata. He’ll be my Silver Gaucho. So it was that Eduard Millan, the little boy from Connecticut with the snakey skin and the sideways hair, named his lead character after the busy river at his door. For the first two weeks we had no wi-fi. We did, however, have birdsong, sunshine and gentle breezes in the mornings, beach walks and salty swims after breakfast and long naps after lunch. We had pre-dinner drinks on the upstairs balcony in the treetops where we were entertained alternately by some very ‘cocky’ sulphur crested cockatoos and our delightfully engaging grand-daughter. We read books, met up with long-standing friends, ate far too much (probably drank far too much), laughed and occasionally sang. Sometimes we just lay about doing nothing. Eventually we had wi-fi connected – seems wi-fi is essential for beach house rentals on the Mornington Peninsula! I don’t claim to know a lot about holiday rental properties – but I do know a thing or two about rest and relaxation. Both are better without wi-fi. Today I’d like to introduce The Scriptwriter of ‘El Gaucho de la Plata‘ – The Silver Gaucho. And for the record: I. too, have eaten costillas at Viejo Roble. I have been looking forward to this meeting for weeks. Words turn me on, Spanish words in particular. 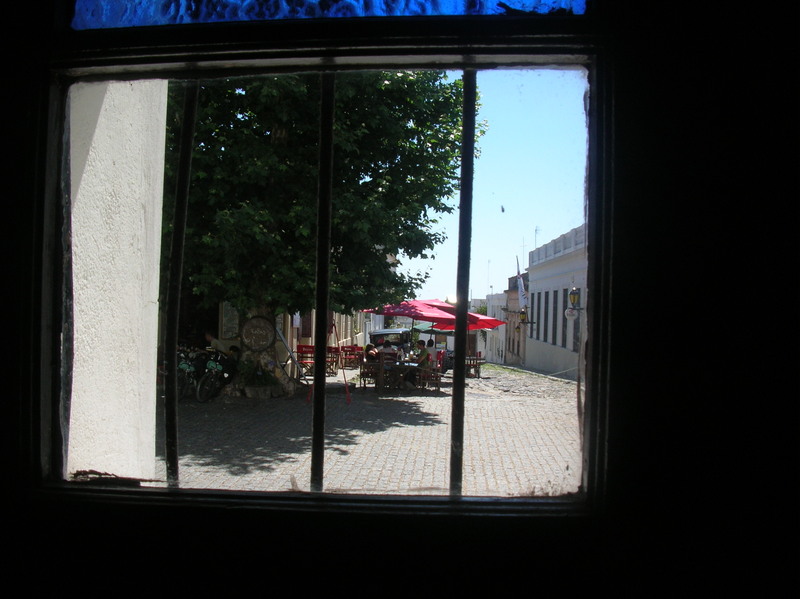 On a bright and cloudless day in 2001, I am having lunch with the scriptwriter, Dante Corsini, at a parrilla in San Antonio de Areco. He has brought me here to tell me how El Gaucho de la Plata began for him. Meanwhile, the cast and crew are out in the grounds of the Parque Criollo filming the La Boda episode. Dante and I have run away, escaped from the melee. We agree that we both feel like truants. The scriptwriter makes a note in his workbook before returning to the costillas, the juicy beef ribs on his plate, and the deep-red Malbec in his glass. I tuck in too. Lunch is good. And the scriptwriter is eloquent, persuasive, as he fills me in on the backstory. Dante Corsini is a slight man. His features are small. His dark hair is longish, ear-lobe in length, but neatly cropped. He is, perhaps, in his early thirties. Nothing about his appearance sets him apart: black T-shirt, blue straight-leg Levis, Dolce & Gabbana sunglasses, shadow of stubble. He looks like so many other young, artistic Argentinos. However, it’s not his looks that have confirmed the scriptwriter’s reputation, but rather his ability to write sharp, entertaining dialogue – gaucho speak. He explains his strategy. First, he says, he forms the idea of the person: temperament, preoccupations, qualities, foibles. And when he has a grasp on the profile he goes looking for the voice. He needs inflections, emphasis, vocal mannerisms. He assures me that enunciation and expression become the breath of life on screen. When he was first appointed by Eduard Millan, Dante began his research by reading the iconic ‘Martín Fierro’, hoping that in the words of José Hernández’ epic poem he would find what he was looking for. He drove to outlying flatlands and humid hinterlands to investigate tales of the folk hero, Gauchito Gil, but found disparities from region to region, which made the scriptwriter question the integrity of the information. He dug into the wealth of gauchesco literature and found the stories gave him ideas for plot lines and minor roles, but they did not solve his most immediate problem. San Antonio de Areco is a tourist town in the province of Buenos Aires. The scriptwriter says he first came here to immerse himself in gaucho culture and, hopefully, to find a model for his gaucho voice. He tells me that lunching here at Viejo Roble became a highlight of his week in the small town. The food is good, he says. My mouth is full. I nod in agreement, put down my costilla and wipe the excess from my mouth and chin. Dante tells me that he prefers to sit, like this, at the periphery of life, where he can watch and listen and make notes. Sometimes he imagines that he might be invisible. He wonders if people can see through him. We laugh at his word play. I like the way his mind works. I enjoy his company. Dante Corsini is an eavesdropper. Escuchar tras las puertas is the local term. He explains that the literal translation is ‘listening at doors’. Each day, whether he was strolling through the Parque Criollo, riding his rented bike through the dusty streets or deep in thought in the Museum Gauchesco, the scriptwriter was listening. Sitting in the church of San Antonia de Padua, deliberating over chocolates at La Olla de Cobra or nursing an aperitif in one of the old pulperias, he was stealing language from under unsuspecting noses. Across the table, the scriptwriter is excited; he is nearing the climax of his story. On Friday afternoon, the final day of his voice-finding week in San Antonio de Areco, Dante cycled along the river bank to join the fogon. This, he tells me, is the traditional weekly gaucho meeting held mainly for the tourists. At the fogon he stood in a circle watching the men play taba. That’s when he heard the voice. The man with the perfect gaucho voice was well dressed, bien empilchado. He wore a red, white and black-striped poncho over one shoulder with a bright-blue silk kerchief knotted at his neck. The polished silver handle of his knife, his facon, protruded from a blue belt and his black woollen bombachas, were tucked into black leather boots. A rakish, wide brimmed chambergos shaded his face. As it transpired, the magnificent gaucho was an articulate man. He explained that he had driven up from Buenos Aires especially for the fogon. He came each Friday, when he could get away from the office. In the real world he was an account director for a multi-national advertising agency. Writers need their work reviewed. Feedback nourishes the creative mind. A good review in the press or on air will sell books. A damning review will likely cause angst, a string of expletives, a lot of hand wringing and pot banging, and eventually, introspection, a rethink and a return to writing. There is another form of review, however, far richer and more powerful than words in the public domain and that is direct reader response. That someone reads my words; considers them and takes the time and effort to contact me with their response never fails to bowl me over. Since the release of The Silver Gaucho in September I have received a number of emails from enthusiastic readers. I have also received seven hand written cards, each selected, inscribed, stamped, posted and delivered. These personal reviews are my treasures. They spur me on to write more – to write better – to keep these readers with me. Some months after the release of How to Stop a Heart from Beating, I was talking with a book group about the character of Solly McKeen and her 9 year old take on her world. A woman in the group was bubbling with eagerness about the book and rattled off direct quotes from Solly and her family. It wasn’t just single lines either – she could recount entire conversations verbatim. I was gobsmacked. Here was a reader who was so familiar with my work that she had committed chunks of it to memory. Today I thought I would introduce you to one of the minor characters from my recent novel, The Silver Gaucho. Here is The One-eyed Man, a keen observer of the daily soap opera, And there are no spoilers here – the novel opens with the death of El Gaucho de la Plata, star of the soap, in a car accident. The one-eyed man stands outside the only shop in Paso de los Indios. The locals call the shop la esquina; the corner. From this vantage point, in the middle of the Patagonian desert, the old man watches everything. Each day he sees the two buses that stop – the first heading east to Rawson, the second going west towards Esquel. On rare occasions there are tourists on the buses. Sometimes they take photographs of the one-eyed man. Not because of his one eye, but because he looks different, conspicuous. His black sombrero and yellow scarf are flamboyant. He carries himself as if he was once a warrior. To the tourists he looks like a man with a past. Few realise how small he is inside his coat. The one-eyed man was once a gaucho. My halting Spanish makes questions difficult, but I ask them anyway. Once started, the old gaucho is eager to talk. His one working eye flickers like a neon light as words tumble out from some place below his greying moustache. I write quickly, capturing as much as I can as he speaks. The one-eyed man says he seldom sees cars. Not many vehicles use this road. But horses are different. By comparison, lots of horses come and go, waiting while their riders make purchases in the only shop in Paso de los Indios. These are Criollo horses. They need no tethering. They are obedient, he says. They stand quietly in the dust, in the sun, while their riders roll smokes in the measly shade of the only tree. The old gaucho tells me that he never dwells on the day he lost his eye. He was chasing cattle and his horse lost its footing. The gaucho was thrown onto a jagged rock that hooked his eye out of its socket. He carried the eyeball home in his pocket and still keeps it in a jar. The empty socket healed and the one-eyed man wears the scar with pride. With a crooked smile the old gaucho talks of nights by the river, resting against his recado, his saddle. He smells again the asado con cuero cooking him the sweetest beef in the Americas, he relives wild rides when the cattle sensed water. He hears the echoes of laughter, remembers the high spirits of the gauchos when fresh-killed meat was being salted. All these memories make him smile and when the man with one eye smiles, he flashes three gold teeth. I ask him how he feels about the death of El Gaucho de la Plata and he looks away. It is minutes before he replies. I wait impatiently, not wanting to hurry him, but conscious that my time is limited. The one-eyed man says that when he watched the first episode he saw quickly that Luis Mabon was not a gaucho. He was too big, probably Tehuelche blood. The best gauchos are smaller, supple, thick-set men who move quickly. They are men of the earth. They are Mapuche, like the one-eyed man. Luis Mabon was tall, raw-boned. He was a horseman, yes, but he was never a gaucho. He did not hold his head so. By the end of the first programme the man with one eye realised that the gaucho who rode the horse with vitality; the one who wore the billowing bombachas and fancy red pañuelo; who cut and wound in and out through running cattle, his knife flashing at his back; who could spin and throw the boleadoras with accuracy – was not Luis Mabon but another. And as he watched, he came to the conclusion that there must have been two gauchos making one. If that is so, says the observant man from Paso de los Indios, then it was the impostor who died. The gaucho lives. I shake hands with him and assure the old gaucho that he is, indeed, perceptive. I wish him well and run back to try and appease a cranky bus driver. David was on sabbatical at the University of Umeå and we were staying in one of their apartment s on the edge of the museum complex in Gammlia. From our door we had 10 kms of wooded trails for walking, biking and skiing. We arrived at the end of August and stayed until mid November. During that time I took a photograph from one particular window each morning at around the same time. It’s not an original idea. If you have seen the movie Smoke, you will remember Augie Wren and his photographic collection. 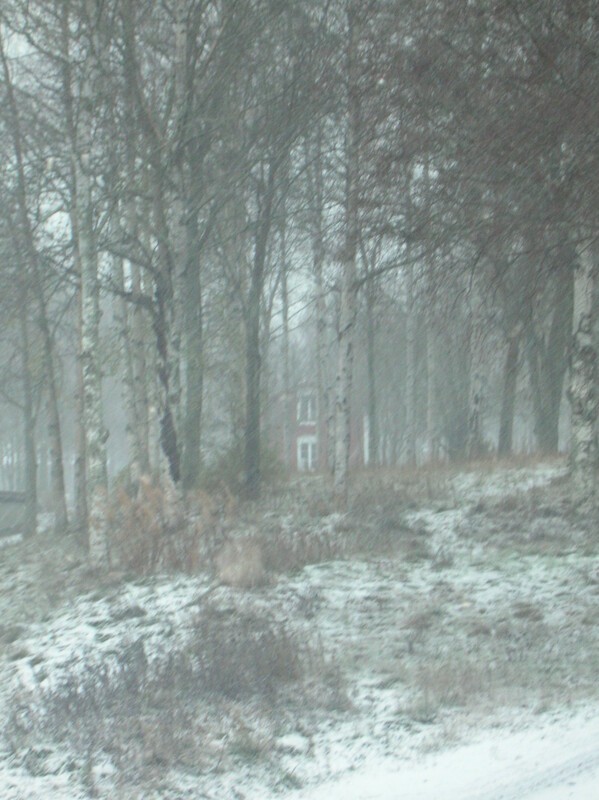 Anyway, the pics included here give some idea of the changing weather outside our warm and cosy apartment. I think it makes quite a visual essay. 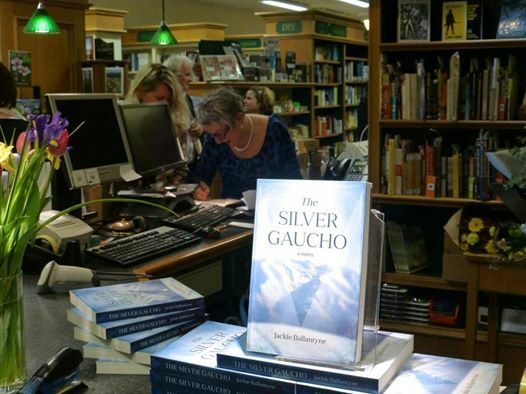 It’s three weeks since The Silver Gaucho was launched and already copies of the book have crossed oceans and continents. Readers in Australia, Argentina, United Kingdom, Sweden, Germany and Spain are now following (or have followed) Lockie Steele’s adventures. Thank you to all those loyal readers. I was looking for some pics for a presentation this week and came across this one taken in Argentina in 2007. 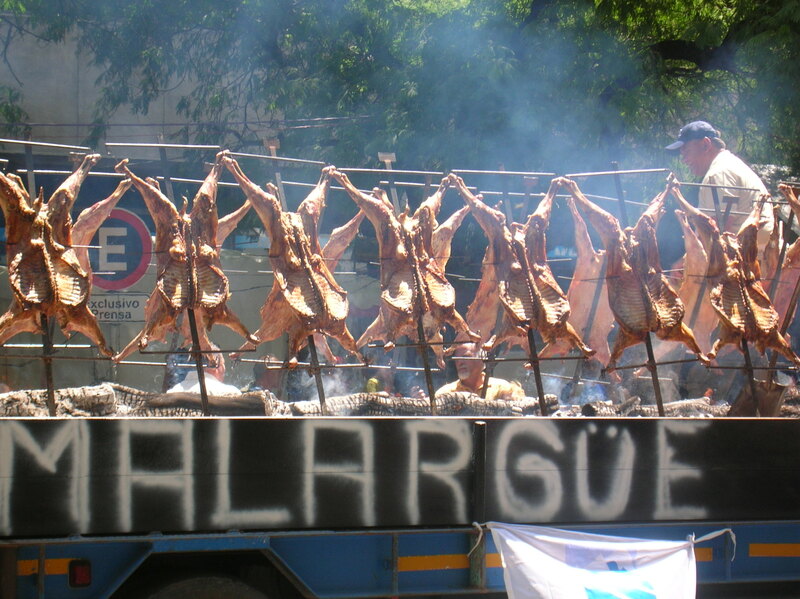 We were in Mendoza and came across a barbecue on the back of a truck. The smell was tantalising. 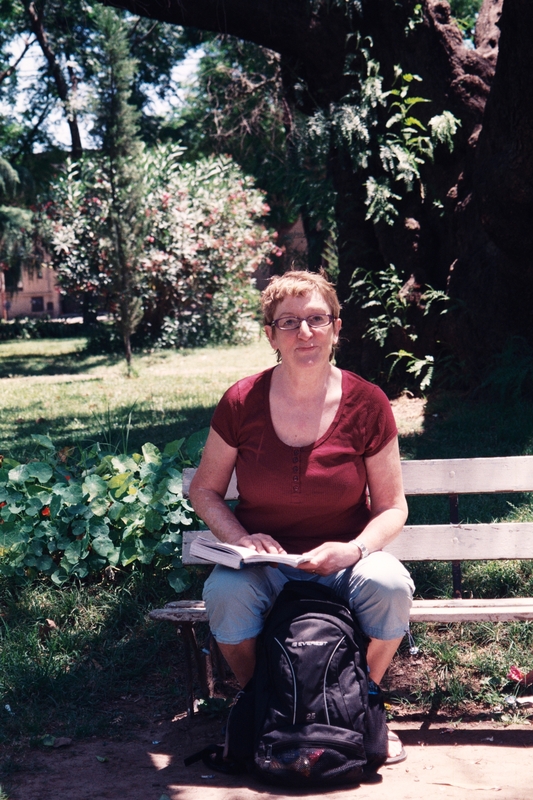 And here I am in San Antonia de Areco (if you’ve read the book this will be familiar). I’m taking a breather in the Ricardo Güiraldes Criollo Museum and Park – and no doubt I’m reading about gauchos. So – where will The Silver Gaucho travel next?